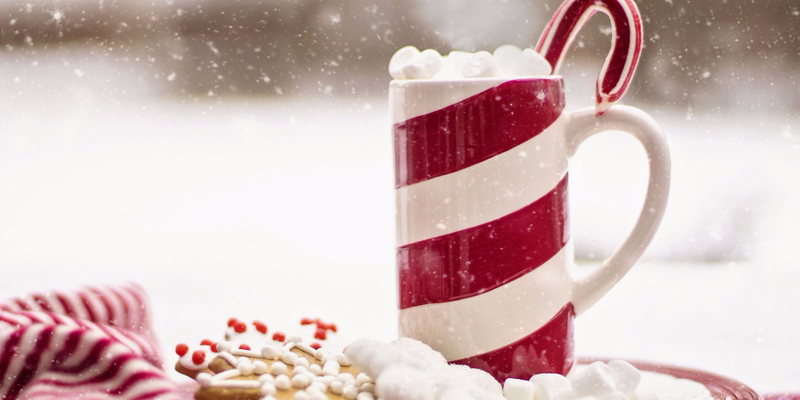 The holiday season brings us abundant opportunities for baking and creating. That’s a pretty simple statement, but knowing where to can be an overwhelming thought. When we’re short on time, how do we make it simple and fast? I have been considering whether I want to make the usual holiday treats or be adventurous and mix up some surprises to grace my friend’s and neighbor’s tables this season. Sugar cookies, fudge, and bourbon balls are pretty standard. Assuming I’ll have the time to do all the cooking I have imagined, I’ll be creating magic in the kitchen long through the holiday season. What if we are new to holiday baking? Or maybe we aren’t feeling inspired? Trust me. I’ve had lots of times when I’ve been left wondering what to make. Traditions are lovely, but sometimes they leave me flat and longing for something yet to be invented. Today I am sharing some ideas with sugar cookie dough to nudge us out of the holiday baking doldrums and speed us along to fascinating everyone with clever creations from our kitchen. Sugar cookies always bring back sweet memories of baking beside my mom at Christmas time. As a novice, I wasn’t very good at it. My cookies would be thicker in places than others, thus making a cookie that was well done in some areas and not so much in others. They still tasted good and were always perfect with a cup of Christmas tea. So this week’s column is all about basic sugar cookie dough. The sugar cookie is forgiving whether they are slightly underbaked or slightly overbaked. Alicia, a twitter follower from the UK, asked me today what is a sugar cookie. It’s funny; this cookie is one that I always thought has existed since at least the beginning of time! I was mistaken. It’s a reasonably new baking creation. 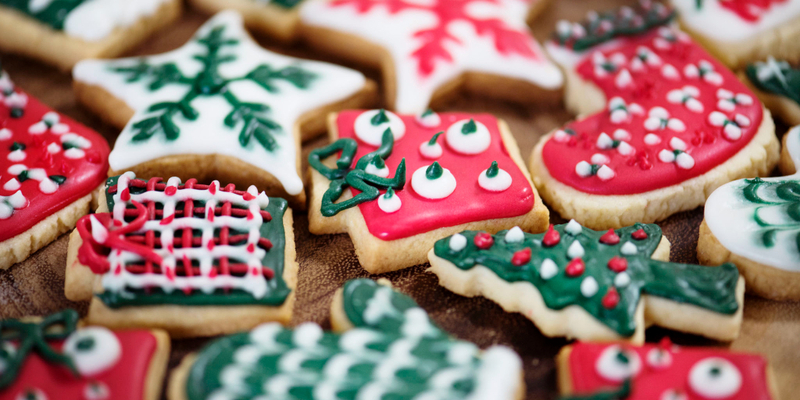 Sugar cookies were first created in by the Nazareth colony in early 1700 Pennsylvania. At least the sugar cookies we know in the United States today and make to decorate for the Christmas and Valentine holidays. According to mobile-cuisine.com, they likely emerged from France “gimblettes ” and Italy’s “cimbellines.” So now we all know this little fun fact! Take out your mom’s recipe box and look for her tried and true sugar cookie recipe or use mine listed at the end here. It can be made up to 3 days ahead. Now for some ideas on how to use this basic dough to make a variety of cookie gifts! Replace vanilla or almond flavoring with coffee flavoring. Coffee flavoring will make a slightly darker cookie. Cut into 2-inch rounds and when finished baking and cooled, dip a side of each in chocolate and lightly dust with confectioner’s sugar. Add a treat bag of these to a basket with a pound of coffee and a fancy, vintage spoon! Who would not feel special receiving this gift?! Peppermint flavoring is a fun change. This time roll the dough out into rectangles and cut into 2-inch After baking and cooling, dip one side in chocolate and sprinkle with crushed peppermint hard candy. Put a few in a treat bag and tie with a pretty red ribbon. When my kids were little, I would divide the dough and add a drop of food coloring to each section and then let the kids work the color into the dough. They would roll out the dough and choose their favorite shapes, or combine their colors with their siblings and make multi-colored cookies. Before baking the cookie shape, create a small hole at the top through which once baked, we can thread a string or ribbon through. Then use the finished cookie as an ornament! This idea is most likely my favorite method for decorating angel cutouts. Before baking, I lightly sprinkle each cutout with a fine, white crystallized sugar. Sometimes simple is the best. Preheat oven to 375°F. Cream butter and sugar in large mixing bowl until light and fluffy. Beat in eggs and flavoring. Combine flour, baking powder, and salt. Gradually add to butter mixture; mix well. Divide dough into fourths. Roll out one-fourth of dough on a lightly floured surface to 1/8 inch thickness. Keep remaining dough refrigerated. 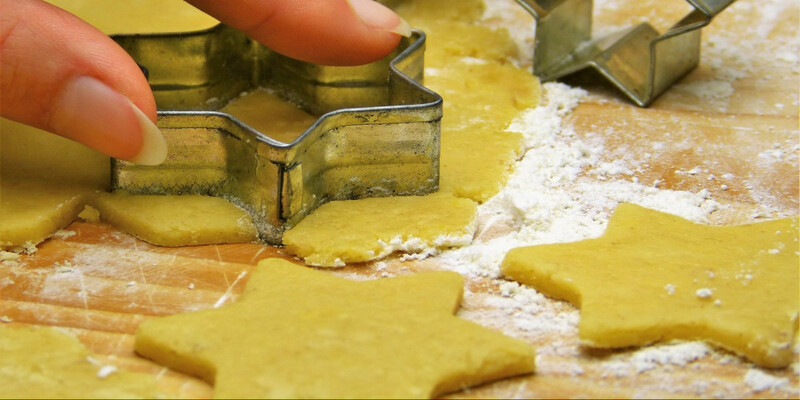 Cut into desired shapes with floured cookie cutters. Place 1 inch apart on ungreased or parchment lined cookie sheets. Bake 6 to 8 mins. or until lightly browned. Transfer cookies to wire rack; cool completely. Decorate as desired. Makes about 2 dozen cookies. Happy baking! Please share your Christmas baking memories!